For whatever reason, the Elephant Bar is a restaurant that I have known about for quite some time, but never got around to checking out. I'm glad to say I finally did check them out and I was quite impressed. The Elephant Bar is a chain of restaurants in the United States with about 29 restaurants throughout seven states with the majority in California. 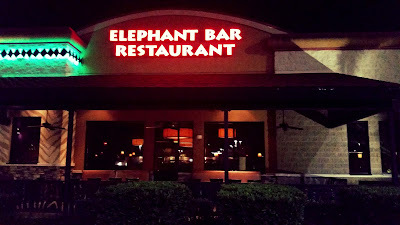 Elephant Bar restaurants are also located in Arizona, Colorado, Florida, Missouri, New Mexico, and Nevada. The inside is a mixture of casual and upscale with a design theme based around an African safari, with wildlife motifs, zebra stripes, leopard prints and of course elephants galore. The menu at Elephant Bar features American cuisine with a global twist and is focused on pan-Asian fusion all made from scratch with fresh ingredients and a fun and daring cocktail list with plenty of beer and wine to choose from as well. You can choose from such items like the Shanghai Cashew Chicken, Mongolian Beef, a Japanese Ahi Rice Bowl, or items like a Macadamia Crusted Fish ‘n’ Chips all the to way to a Shrimp and Chicken Jambalaya with Andouille Sausage. If any of that is too daring they also have a good selection of fresh fish, sandwiches and burgers, and a pretty enticing salad selection. Starting at the Shareables menu, we ordered the Quick Seared Ahi Tuna served with mixed greens, crispy rice noodles and ponzu sauce for dipping. This was a fresh and flavorful dish that just melted in your mouth and paired really well with the fresh mixed greens. For our Cocktails we started out with an E.B.R Mule pictured left and an E.B.R Margarita pictured on the right. We also enjoyed the Barbados Punch and a Rum Tiki, all of which were great tasting. All cocktails at Elephant Bar are made with premium spirits, fresh juices and simple syrups made in house. Onion Rings are offered as a side order, but you can request them ahead of your meal. These onion rings were beer battered and full of flavor. The Mongolian Beef features thinly sliced beef, shiitake mushrooms, hot chili peppers and mixed vegetables with your choice of white or brown rice. This was actually quite good with plenty of tender slices of beef. Be cautious though, you can opt not to have the peppers in your dish. The peppers are not meant to be eaten, but are added to the stir fry for a little added heat...and if you accidentally eat one, you will be in tears. I was really impressed with the Shrimp and Chicken Jambalaya that was packed full of sauteed shrimp, andouille sausage, and chicken with onions, peppers and rice. They do not skimp on the portions of meat in this dish. The jambalaya was very flavorful and savory with just the right amount of heat. Bonus points for the delicious garlic bread on the side too. When you come across a dessert by the name of Gooey Butter Cake, chances are it's going to be good. This dessert is layers of yellow cake and cream cheese topped with vanilla ice cream and a bourbon toffee sauce and was simply magical. 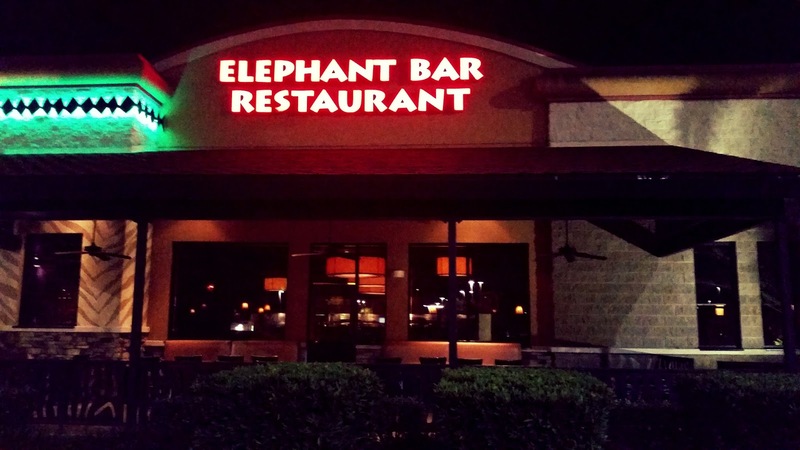 Elephant Bar has something for everyone and the menu will take your taste buds on a journey. We really enjoyed our time there and all of the food was wonderful. After a day of shopping at the Mall at Millenia or if you're just out and about, stop by for a bite or grab a drink or two. They have a happy hour from 3:00 pm to 7:00 pm and again from 9:00 pm until close.